When Rebecca’s childhood abuser escapes justice, it sets her on a path to revenge, revenge on any man who preys on the innocent. Twenty-three-year-old Rebecca poses as a child online and sets her trap, luring one sexual predator after another to their deaths. When a severed head and other body parts are found washed up on a windswept estuary beach, the police begin their investigation. If you’re looking for a page-turning book you won’t be able to put down, discover John Nicholl’s stunning new thriller today. I received an ARC of A Mind To Kill from the author in return for an honest review. This is a deeply disturbing book that deals with child abuse, murder and gruesome scenes. I’ve read and reviewed books by John Nicholl before: Bully Boy Blue and Portraits of the Dead. Both dark, gripping stories where the author shows his knowledge of police matters and certain kinds of crimes. For me A Mind To Kill is his most grim yet. It is obvious from the book blurb that it will be macabre in parts; readers are warned. There are graphic scenes that some may want to skim through. But it has to be borne in mind that these have a reason to be there; for revenge against one of the most horrific and vile crimes; child abuse. That said I will review as usual. And, having met Inspector Gravell (Grav) in a previous book, I was disappointed in the change in him. I know, having lost his fellow partner, Detective Sergeant Clive Rankin, he would be a more embittered and cynical character but he is portrayed as a completely unpleasant man in this book. His previous bluff yet compassionate side is well hidden. Mostly the dialogue is realistic and plausible and differentiates the characters but every now and then, especially in the conversations between Rebecca and her mother I found it difficult to realise who was speaking. And, in other parts of the book, there is what I call ‘head hopping’ between characters. The spoken and internal dialogue between characters jumps from the point of view of one of the characters, usually one of the two main characters to the mind of someone else, sometimes even a minor, flat character who adds little to the main plot or only appears once in a short side plot. Beyond an internal setting of one room, graphically and frighteningly described, there are few external settings, But these are well written and give a strong sense of place. 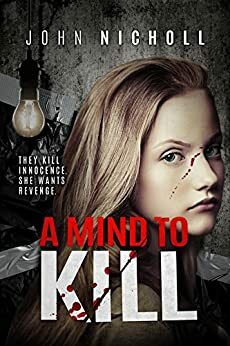 A Mind To Kill is an extremely dark psychological thriller; the strong emotions, the vengeance, the hatred, the evil radiates throughout the story . The boundaries of right and wrong blend and become difficult to identify with. It’s a book that is both contentious and provocative. I would recommend it for readers who understand that there is true evil in the underworld of vile child abuse… and have a strong stomach. This entry was posted in #Blogging, authors, blogging, Book Reviews, Books, contemporary fiction, crime, psychological thriller, Review and tagged A Mind To Kill, books, Child Abuse, John Nicholl, Relationships, Reviews, writing by Judith Barrow. Bookmark the permalink.